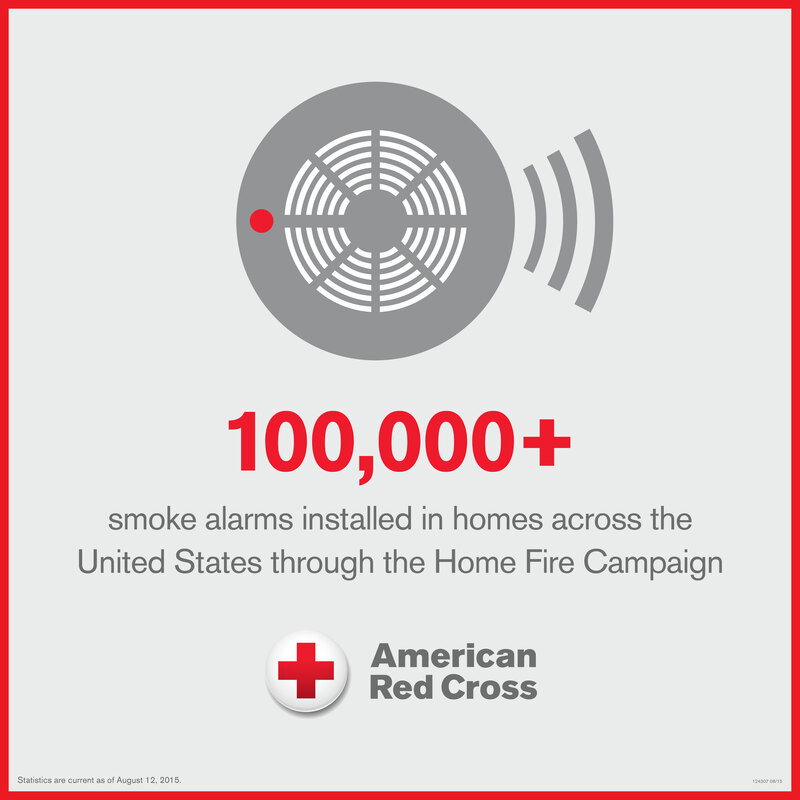 WASHINGTON D.C. – August 13, 2015 — The American Red Cross and its partners have saved 15 lives and installed more than 100,000 smoke alarms in homes across the country during the last ten months. This accomplishment is part of a nationwide Home Fire Campaign launched last October to reduce the number of people who die or are injured during a fire in their home. Since the Home Fire Campaign began, the Red Cross and its partners have installed smoke alarms in almost 2,000 cities and towns in all 50 states. The campaign has already helped save 15 lives in five states ranging from a 3-year-old child to a 73-year-old grandmother. On on October 10, we’re planning to installed more than 1000 smoke alarms in just ONE DAY! Visit, http://bit.ly/Goal1000 for more information and to sign up. The campaign is a multi-year effort to reduce the number of home fire deaths and injuries by 25 percent. Working with fire departments and community groups across the country, the Red Cross is installing smoke alarms in homes in neighborhoods at high risk for fires and teaching residents about fire prevention and preparedness. The Home Fire Campaign is powered by more than 1,800 local community partners and more than 40 national partner organizations. Key supporters include: International Association of Fire Chiefs (IAFC); Federal Emergency Management Association (FEMA); United States Fire Administration (USFA); Rebuilding Together; Buddhist Tzu Chi Foundation; Meals on Wheels America; Corporation for National and Community Service (CNCS); National Council on Independent Living (NCIL); Fire Department Safety Officers Association (FDSOA); Vision 20/20; Project Paradigm; Hope worldwide; Habitat for Humanity; Portlight Strategies, Inc.; and Lott Carey. WHAT PEOPLE CAN DO The Red Cross asks everyone to take two simple steps to help prevent injury and death during a fire in their home – check their smoke alarms and practice fire drills at home. Every household should develop a fire escape plan and practice it several times a year and at different times of the day. The plan should include two ways to get out of every room and a place to meet outside. Consider escape ladders for sleeping areas or homes on the second floor or above. People should also install smoke alarms on every level of the home, inside bedrooms and outside sleeping areas. The alarms should be tested every month and the batteries replaced at least once a year. People can visit redcross.org to find out more about how to protect themselves and their loved homes from fire or contact their local Red Cross to learn about the location of local smoke alarm installation events. They can also help by volunteering their time or making a donation today to Red Cross Disaster Relief by visiting redcross.org, calling 1-800-RED CROSS or texting the word REDCROSS to 90999 to make a $10 donation. Donations to Disaster Relief will be used to prepare for, respond to and help people recover from disasters big and small. We respond to nearly 70,000 other disasters every year, from home fires to hurricanes and more. Learn more about how Disaster Relief donations have helped people affected by previous disasters including home fires. Previous Previous post: Pillowcase Project on Fox40 News!